Received: December 2, 2018; Accepted: December 6, 2018; Published online: December 30, 2018. Acne vulgaris is a chronic skin disease of pilosebaceous units with multifactorial pathogenesis that affects about 80% of adolescents and young adults. Although various treatment modalities for acne are reported, treatment of acne with minimal side effects is challenging. In this report, we treated a patient with acne vulgaris using long-pulsed 1,064-nm neodymium:yttrium-aluminum-garnet (Nd:YAG) lasers. After two sessions of long-pulsed 1,064-nm Nd:YAG laser treatment, the patient presented with nearly complete improvement with no remarkable side effects or recurrence over the duration of 6 months. We suggest that long-pulsed 1,064-nm Nd:YAG laser can be effectively and safely used to treat inflammatory lesions in the skin, particularly acne vulgaris, in Asian patients. Among various treatment modalities for acne vulgaris, lasers may be a good alternative therapeutic options for those patients who fail to respond to or could not tolerate other acne treatments. Various reports of treatment modalities using in patients of acne vulgaris with different light sources, has been detected recently.1,2 Nevertheless, the anti-acne mechanisms associated with some lasers including remain largely unknown and need to be elucidated. Herein, we report a case of acne vulgaris using long-pulsed 1,064-nm neodymium:yttrium-aluminum-garnet (Nd:YAG) lasers. After monthly two sessions of long-pulsed 1,064-nm Nd:YAG laser treatment, the patient presented nearly complete improvement in the lesions with no remarkable side effects or recurrence over the duration of 6 months. A 19-year-old, Korean woman visited our clinic with multiple erythematous papules with pustules on the face and neck (Fig. 1). The patient was clinically diagnosed with acne vulgaris (Fig. 1A, 1C) and was scheduled to undergo laser treatment. After obtaining written informed consent, the patient was treated with 2 sessions monthly of long-pulsed 1,064-nm Nd:YAG laser treatment (GentleYAGTM; Syneron-Candela Inc., Irvine, CA, USA) and was performed at the combination treatment with painting motion technique (10-mm spot size, 13 J/cm2 fluence with 0.3 milliseconds (ms) of exposure time), and a 10 mm spot size, 30 J/cm2 fluence with 30 ms of exposure time, and a total of approximately 200 shots on the skin lesion.4 The treated areas were cooled with dynamic cooling device (DCD) spray (pre 30 ms post 30 ms delay 30 ms), and no prophylactic systemic or topical corticosteroids were prescribed. The patient was recommended to apply nadifloxacin cream and moisturizers. 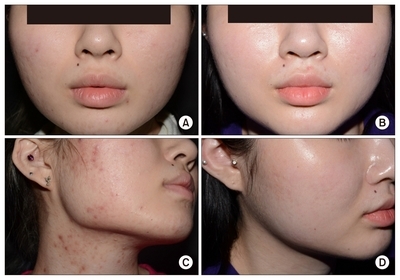 At 6 months after the first treatment of long-pulsed 1,064-nm Nd:YAG laser treatment, the patient presented nearly complete improvement of the acne lesions without worsening or recurrence (Fig. 1B, 1D). After the treatment, the patient also wanted to treat of folliculitis on her chest. The same treatment session was performed and the lesion on her chest also presented nearly complete improvement (data not shown). In conclusion, the authors suggest that long-pulsed 1,064-nm Nd:YAG lasers can be effectively and safely used for treating inflammatory lesions in the dermis and epidermis, particularly acne vulgaris, in Asian patients. Further prospective, controlled investigations are needed to be followed to compare the efficacy and safety of long-pulsed lasers and to optimize the treatment settings for acne vulgaris. Mohamed, EE, Tawfik, K, and Elsaie, M (2016). Intense pulsed light versus 1,064 long-pulsed neodymium: yttrium-aluminum-garnet laser in the treatment of facial acne vulgaris. J Clin Diagn Res. 10, WC01-3. Jung, JY, Hong, JS, Ahn, CH, Yoon, JY, Kwon, HH, and Suh, DH (2012). Prospective randomized controlled clinical and histopathological study of acne vulgaris treated with dual mode of quasi-long pulse and Q-switched 1064-nm Nd:YAG laser assisted with a topically applied carbon suspension. J Am Acad Dermatol. 66, 626-33. Lee, SE, Kim, JM, Jeong, SK, Choi, EH, Zouboulis, CC, and Lee, SH (2015). Expression of protease-activated receptor-2 in SZ95 sebocytes and its role in sebaceous lipogenesis, inflammation, and innate immunity. J Invest Dermatol. 135, 2338. Chiba, C, Usui, A, Hara, H, and Ishi, Y (2009). Clinical experience in skin rejuvenation treatment in Asians using a long-pulse Nd:YAG laser. J Cosmet Laser Ther. 11, 134-8. Papageorgiou, P, Katsambas, A, and Chu, A (2000). Phototherapy with blue (415 nm) and red (660 nm) light in the treatment of acne vulgaris. Br J Dermatol. 142, 973-8. Lloyd, JR, and Mirkov, M (2002). Selective photothermolysis of the sebaceous glands for acne treatment. Lasers Surg Med. 31, 115-20. Lee, DH, Choi, YS, Min, SU, Yoon, MY, and Suh, DH (2009). Comparison of a 585-nm pulsed dye laser and a 1064-nm Nd:YAG laser for the treatment of acne scars: a randomized split-face clinical study. J Am Acad Dermatol. 60, 801-7. Bencini, PL, Luci, A, Galimberti, M, and Ferranti, G (1999). Long-term epilation with long-pulsed neodimium:YAG laser. Dermatol Surg. 25, 175-8. Lee, YB, Kang, NH, Eun, YS, Cheon, MS, Kim, KM, and Cho, BK (2012). Effects of long-pulsed 1,064-nm neodymium-doped yttrium aluminum garnet laser on dermal collagen remodeling in hairless mice. Dermatol Surg. 38, 985-92.